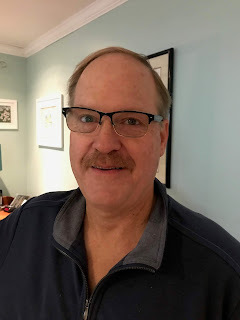 I grew a mustache to show solidarity with others advocating for men's health issues. At the request of Chris and my friends, it is gone now. I was enjoying having it and had begun to grow used to the additional whiskers on my lip. I think I looked good with it, however, many of my friends felt otherwise. I only had one picture taken with it, and I posted it here. It was taken yesterday before I shaved. What a year 2018 has been already, in terms of my appearance. I have begun to wear glasses full-time and I grew my first ever mustache. Just because the mustache is gone does not mean that my drive to support men's health issues has concluded! That is becoming a full-time passion, especially given my own journey with prostate cancer. Men, and women, need to discuss mens health issues. The big four men's health issues are: prostate cancer, testicular cancer, suicide prevention and mental health issues. It is a complete package and men need talk about these things. According to the Cancer network, an estimated 29,430 men will die from prostate cancer this year. According to the American Society for Suicide Prevention, an estimated 31,475 men will take their own lives this year as well. I know that from my own personal journey that I am continually amazed at how many men have a close relative that has had prostate cancer. Yet, many of them have no idea about their own PSA.